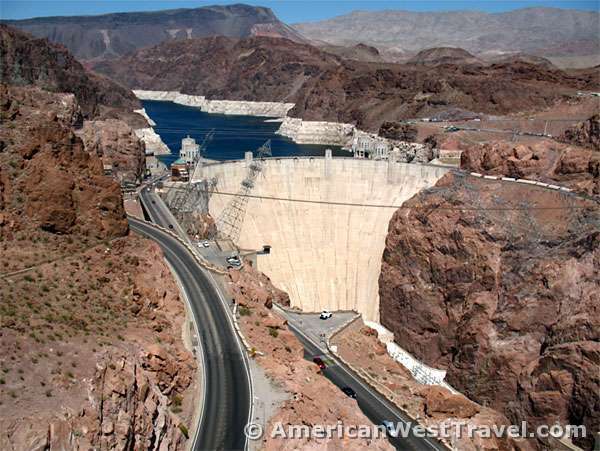 The Hoover Dam is arguably the most famous dam in the world, as well as one of America’s most popular roadside stops. Its fame as a spectacular feat of engineering, its notable history as the most high profile work project of the Great Depression, and the photogenic setting in the depths of the narrow Black Canyon of the Colorado River make it a favorite stop for tourists from all over the world. The 2010 opening of the Mike O’Callaghan–Pat Tillman Memorial Bridge, an engineering marvel in its own right, adds to the interest. The location close to Las Vegas (30 miles away) assures nearly a million visitors a year. Millions more travelers cross the bridge each year. The dam was completed in 1936, and the Bureau of Reclamation started offering guided tours of the inside of the dam and the power plant in 1937, and these tours are still available today. Many private tour operators offer packages (by bus, helicopter, etc.) for visitors staying in Las Vegas and not wishing to drive. Some offer combo packages including the Grand Canyon Skywalk which is nearby. Las Vegas visitors should consult with their hotel for options. 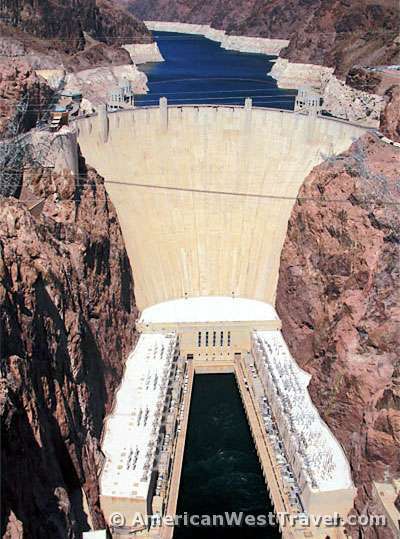 After the dam opened, it offered a direct driving route between Phoenix, Arizona and Las Vegas, Nevada. This direct route, US-93, crossed the Colorado River over the top of the dam. This was actually a rather exciting driving experience, as the road dropped sharply into Black Canyon with steep grades and sharp curves with the payoff being the strange and photogenic drive over the top of the dam. As the Southwest started to grow enormously in recent decades, commercial and tourist traffic on US-93 grew enormously as well. The slow route over the dam became untenable, and after 9/11 there were security concerns as well. Construction of a bypass bridge began in 2005, and the Mike O’Callaghan–Pat Tillman Memorial Bridge opened in 2010. At nearly 900 feet above the Colorado River, the bridge is the second highest in the United States. It is also the highest concrete-arch bridge in the world. 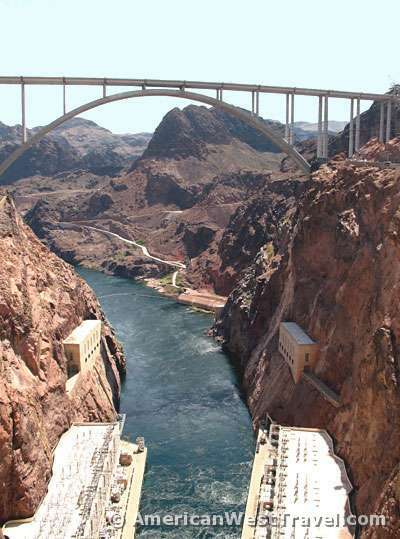 The new bridge also offers a spectacular vista point for viewing Hoover Dam, Lake Mead, and the desert beyond. However drivers cannot stop on the bridge, and you cannot see the view from your car. Instead, pull into the dam complex (on the Nevada side) and park in the bridge parking lot. From there, a short, paved trail goes up to the pedestrian viewing gallery on the outside of the bridge. The name of the bridge is also of interest, featuring one individual from both of the connected states.. Mike O’Callaghan was a prominent governor of Nevada. Pat Tillman was famously a star defensive back for the Arizona Cardinals of the NFL. After September 11, 2001, he left the team (leaving millions of dollars on the table) and joined the army. He was subsequently sent to Afghanistan and killed in action by friendly fire, a tragic yet uplifting story which has made Tillman an Arizona legend. Check out our new and updated Prepackaged Travel Planners.